While banana production is a fruit crop, it generates large amounts of forage material that can be used to feed livestock. Banana leaves, which grow continuously from the center of the stem, are broad blades, 1-4 m long x 0.7-1 m wide, with a pronounced supporting midrib. Banana leaves and petioles are sometimes called banana tops. Banana pseudostems, usually called banana stems, banana stalks or banana trunks, are cylindrical, made of overlapping leaf-sheaths, and 20-50 cm in diameter. Banana leaves and pseudostems can be fed to animals in fresh, ensiled or dried form (Ecoport, 2010; Ecocrop, 2010). Banana leaves and pseudostems are a by-product of banana production and are usually available near to the fields and processing plants. They can be found in all tropical and subtropical regions of Asia, America, Africa and Australia where bananas are grown. For more information about the distribution of bananas, see the Banana (general) datasheet. Banana production yields large quantities of forage biomass. For an average crop fruiting 1.5 times a year, forage biomass can amount to 13 t/ha/year (Ffoulkes et al., 1977). Banana leaves contain about 85% water and 10-17% protein (DM basis). Pseudostems contain mostly water (92-95%) and very little protein (3-4.5% DM) (Ffoulkes et al., 1977). Fibre content is high, in the 50-70% DM range for NDF and about 30-40% DM for ADF (Feedipedia, 2011). Banana foliage contains large amounts of total polyphenols (up to 8% DM), mostly in the leaves, but very few condensed tannins (Marie-Magdeleine et al., 2010). Banana foliage is a useful source of roughage in many tropical countries. Particularly, it can be used as an emergency feed in case of drought or feed shortage (Reynolds, 1995). Pseudostems and leaves can be fed separately or mixed together. They can be fed fresh or sun-dried, whole or chopped. Pseudostems are easily ensiled if chopped and mixed with an easily fermentable source of carbohydrates such as molasses or rice bran. The silage is of good quality (Göhl, 1982). Banana foliage cannot meet animal requirements alone and must be supplemented with nitrogen and energy, or be part of a diet containing other feeds and forages (Ffoulkes et al., 1978a). There are significant differences in degradability and digestibility between banana leaves and pseudostems. Unlike other plants, the digestibility of stems is higher (75%) than that of leaves (65%) (Ffoulkes et al., 1978a) and OM and DM disappearance follow the same pattern (Kimambo et al., 1991). The probable explanation is that the erectness of pseudostems is achieved by the way in which water is held in the cells, and not by the presence of high levels of lignin in the cell wall. The high tannin content of leaves may also explain their lower digestibility (Marie-Magdeleine et al., 2010; Kimambo et al., 1991). DM intake for pseudostems is very low (13 g/day/kg W for Zebu cattle, 6.6 for goats), probably due to their high moisture and low protein content (Geoffroy et al., 1978; Ffoulkes et al., 1978a). DM intake for leaves is higher (23 g/day/kg W in Zebu, 13.6 for goats, 20 for lambs) (Geoffroy et al., 1978; Ffoulkes et al., 1978a; Marie-Magdeleine et al., 2010). There have been many experiments concluding on the positive effects of banana foliage when well supplemented or used in complete diets (Reynolds, 1995). Inclusion of banana leaf meal up to 40% in the forage ration increased weight gain and feed efficiency of Zebu cattle and sheep (Garcia et al., 1973). In growing calves, a 40:60 mixture of pseudostems and corn silage reduced feed costs and increased digestibility, but DM intake and body weight decreased (Dormond et al., 2001). In the Seychelles, young crossbred Jersey steers fed chopped banana leaf and pseudostem residues supplemented with urea/molasses and leucaena foliage experienced growth rates of 0.4 kg/day (Preston et al., 1987). Weight gains between 0.5 and 0.7 kg/day were obtained on steers fed banana tops supplemented with molasses and urea (Rowe et al., 1978). In Zanzibar, banana forage could provide maintenance rations in the dry season and reasonable growth in penned animals when combined with other feeds (Reynolds et al., 1983). Fresh banana foliage could be included up to 15% (diet DM) in the rations of lactating cows without significantly altering milk production, though dairy performance and digestibilities decreased as banana foliaged increased in the diet (El-Ghani, 1999). 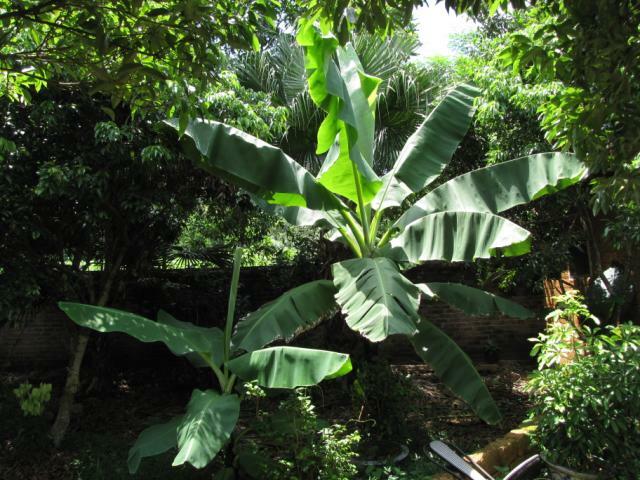 Ensiling banana foliage with other ingredients can be a valuable strategy. Banana foliage and wheat straw (75:25) ensiled with molasses and urea could replace 50% of green maize in the diets of Red Sindhi cows without altering milk yield (Baloch et al., 1988). Banana foliage ensiled with broiler litter (40:60) and molasses or whey was included at 15% (diet DM) in the diets of lactating buffaloes and was well accepted without adverse effect on milk production (Khattab et al., 2000). Dried banana stalks have been fed to goats (20% of diet DM) (Poyyamozhi et al., 1986) and to sheep up to 50 % with no adverse effects, but daily weight gains were low. Their value was comparable to that of other crop residues such as cereal and rice straws and sugarcane tops (Viswanathan et al., 1989). The value of banana foliage for lamb growth was found to be quite poor, possibly due to the low energy intake (Marie-Magdeleine et al., 2010). In kids, green banana leaves could be included safely up to 25 % of the total diet protein (Hembade et al., 2004). 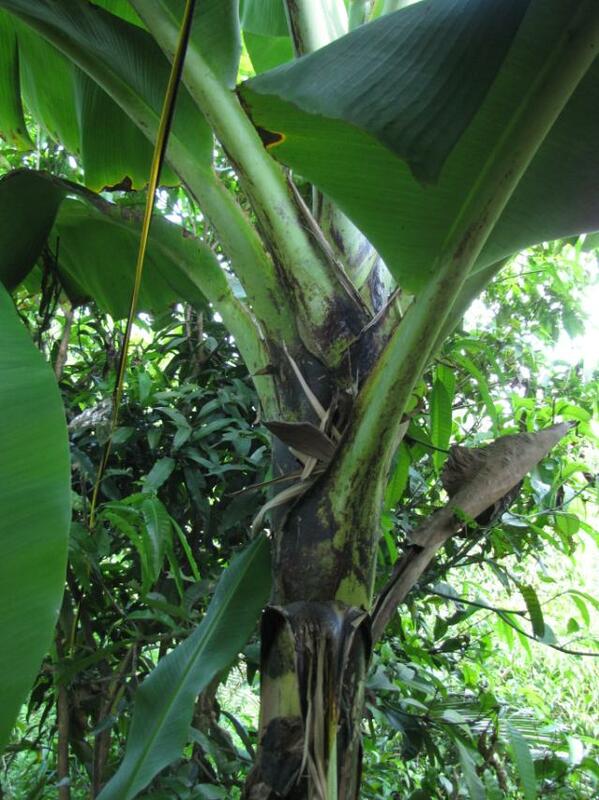 Ensiling with urea was preferable to drying when feeding banana foliage to sheep (Shoukry et al., 1999). The anthelmintic properties of banana foliage, which may be linked to terpenoid and flavonoid compounds, have been demonstrated in lambs, goats and cattle (Marie-Magdeleine et al., 2010; Oliveira et al., 2010; Braga et al., 2001; Olivo et al., 2007). However, further studies are required to establish proper management techniques that use banana leaves to control parasites (Olivo et al., 2007). Like other banana products, banana foliage and crop residues can be a important staple food for pigs for smallholders in banana-producing areas (Buragohain et al., 2010). Banana leaf meal could replace up to 15% of diet DM in growing pigs, resulting in satisfactory average daily gain and feed conversion (García et al., 1991). However, plantain leaf meal had a detrimental effect on ileal and faecal digestibility of most nutriments, including protein, which suggest that it should be used at low inclusion rates in pig diets (Ly et al., 1997). Anthelmintic properties have been demonstrated in the 1950s but need to be confirmed by more recent research (Olivo et al., 2007). Dried plantain leaves replacing 10% of a standard diet in broilers did not affect feed efficiency or feed conversion, and plantain leaves resulted in a slightly better growth than Clitoria ternatea leaves (Marin et al., 2003). Banana leaves were found to be a poor substitute for fish meal and affected broiler performance (Islam et al., 1994). Rabbits could be fed up to 40% banana leaves without negative effects on growth, feed intake and physiology, while a 60% inclusion rate reduced DM intake (Rohilla et al., 2000). In rabbits fed diets containing either 30% sun-dried banana leaves, 30% fresh banana leaves or a 30% combination of fresh and dry leaves, there were no significant differences in weight gains but intake was higher for animals fed fresh leaves. Net returns over feed costs were highest for rabbits fed dried leaves (Fomunyam, 1985). Reynolds, S. G. ; Lund, P. N., 1983. Intensive fodder production systems and by-product utilization. UNDP/FAO Livestock Production Project Zanzibar (Phase II), URT/78/028, Tech. Report 2, FAO, Rome.